Ever get annoyed with the endless highway construction and miles upon miles of traffic? How about the uneven pavement and grooves in the road that take you for a bumpy ride and leave your car a grimy mess? This is thanks to a process called milling. Milling is one of the most common forms of pavement reconstruction. It removes part of a paved surface, such as a road or highway, and can remove a thin layer or a specific level set to a desired depth. Although milling is frustrating for drivers, there are many reasons to mill a paved area. Let us explain! The Machine: A milling project is done using a heavy-duty piece of construction equipment known as a milling machine, or a cold planer. Milling machines use a large, rotating drum that grinds and removes the surface of the pavement. Scrolls of tool holders cover the exterior of the drum and hold the carbide cutters that actually cut the pavement. Water is generally applied to the drum while milling, which helps to reduce the extreme heat produced by the machine, as well as minimize any airborne dust caused by milling. The Process: Milling is done with a few simple steps. First, the milling machine scrapes off the top layer of pavement using a milling drum that is set to the desired depth, typically around 2 inches. The pavement that is scraped off is transferred through the machine to a long conveyor belt that deposits the milled pavement into dump trucks driving at the end of the conveyor. The dump truck then takes the “millings” to be recycled and used to create new pavement. Where does Bortek come in? The milled surface that is left behind is then swept by our street sweepers to clean up any loose debris. The road or parking lot is now ready for new pavement. 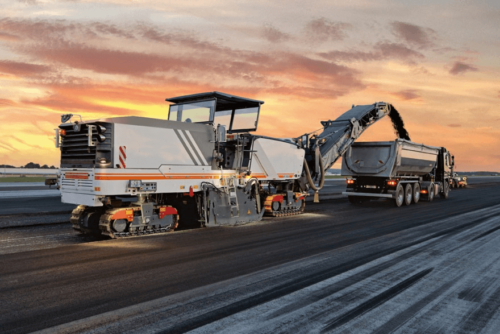 Recycling of the road surface is one of the main reasons for pavement milling. 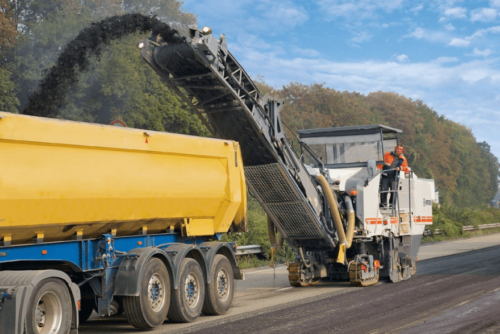 Milling is widely used for pavement recycling today, where the pavement is removed and ground up to be used as the aggregate in new pavement. This reduces the impact that resurfacing has on the environment. It is environmentally friendly. The milled pavement is recycled to make new asphalt. Speed. Aside from resurfacing your lot, milling is the quickest solution to pavement reconstruction. 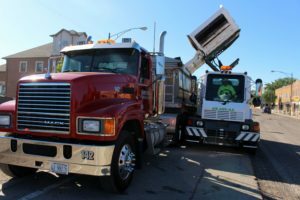 Why you need Bortek Street Sweepers? Working on a milling project is one of the hardest jobs you can find for a street sweeper. Milling is an extremely heavy duty application, especially on highway jobs. The need for an effective and efficient street sweeper is critical. A sweeper in poor shape will shut the whole process down and cost you time and money. On those kinds of jobs, the sweeper simply has to keep up. That’s why we highly recommend our sweepers for the highest performance and quality you could ask for. The street sweeper featured to the right is our Global M4HSD Street Sweepers in action! Along with this bad boy, we carry a number of other street sweepers shown below that are guaranteed to get the job done. Reserve your Global or Dulevo Street Sweeper from Bortek today!